The S450 Deluxe Plus rechargeable sonic toothbrush features a built-in UV sanitizer designed to to kill 99.9% of bacterium and germs on the brush heads. The toothbrush's sonic wave technology provides 30,000 sonic strokes per minute to effectively remove plaque without irritating your gums. It's ideal for those hard-to-reach areas and removes even the toughest stains to leave your teeth naturally whiter! The system includes 12 bonus brush heads- that's 3 years worth of brush heads based on dental professional recommendations to replace your brush head every 90 days. 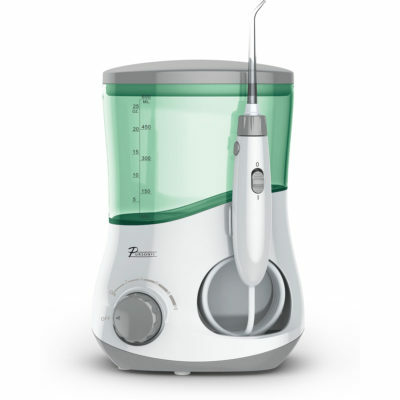 30,000 sonic strokes per minute to effectively remove plaque without irritating your gums. 2 minute timer with a 30 second vibrate alert in order to remind you to brush a different quadrant of your mouth. I have been using this toothbrush for 2 days and I love it. It feels good to your gums while you are brushing, and my teeth already look whiter. I like the 2 minute timer with the four 30 minute intervals. It’s nice to know that the brush head is being sanitized after every use. It has everything I could want in a toothbrush. Can you email us to info@pursonicusa.com with a proof of purchase as the unit has a 1 year warranty and we will help resolve the issue.